Although Ben was personally known for his love of investment, for many it takes a problem or five to motivate one to take on the responsibility of self care. For some, regular flossing is only accepted when they find themselves getting repeated cavities or losing a tooth, for others the habit of maintaining their car is shouldered only after it dies on them on the side of the road. For others still they may only take on the demands of regular strength training when they find their bodies cannot hold up to the challenges of their life. Injury and deconditioning occur, and one is worked into a corner of weakness and inability they would wish on no one. Regardless, it is never truly too late to improve ones self and ones situation (unless your house is actively burning while reading this, in which case, attend to the matter and leave self improvement for another time). One of the greatest ways to cultivate resilience and well being is the ability to pick up a heavy load from the ground, and put it back down with control and confidence. As simple as it sounds, this is an act that defies the majority of our modern day population. Stories abound of folks “throwing their back out” picking up a pen or the paper from the floor, and far worse when the activity is strenuous. In fact is has been estimated that as much as 66% of all work related injuries are associated with lifting, with the majority of these incidents occurring under circumstances that are usual for the person (1). Essentially, the act of lifting things well is a by an large skill foreign to most of us. So if we are all so collectively bad a such a thing, it would make sense to practice it would it not? Enter, the deadlift. 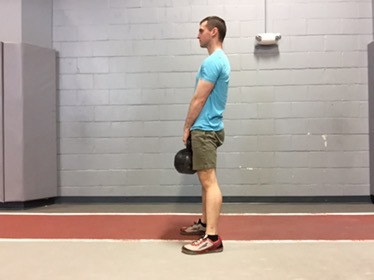 For the unfamiliar this is simply lifting a weight from the floor to waist height and back, as the pictures below demonstrate (the more visually oriented learner can view a video of this HERE). 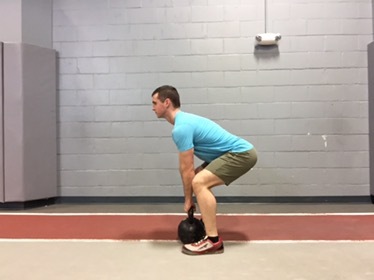 Arguably, this motion is likely the strongest human movement in that it uses the longest lever and deepest socket in our bodies as a prime lever (the hips) through a relatively short range. Additionally the deadlift is arguably the most useful exercise to master in that it practices the very action that so often injures so many of us. Although humanity has been lifting objects from the ground for millennia, it has only been a formal exercise for a couple hundred years at best. This is probably due to the fact that until recent times human had more than enough opportunity in their daily grind to bend over and pick something up. It did not need to be practiced because it was practiced. As manual labor left our lives and assembly lines lifted the work to our hands, this natural human endeavor slowly left us. Back in the mid 19th century a man by the name of George Barker Windship noticed just that, and the problems associated with it (2). He was a medical doctor by training, and a staunch proponent of the necessity of developing a robust physical capacity for ones overall health. Although Windship was not the first to advocate regular resistance exercise for health (even the previously quoted Ben Franklin was noted to regularly exercise with dumbbells a century prior), he is credited with starting America’s first weight lifting boom. Throughout his short career he lectured widely about his theories on human health and physical function, advocating the body be made muscular and strong through resistance exercise and diet (2). Some songs have been sung for a long time. One of his more outspoken recommendations for resistance exercise was found in a movement termed a “hand and thigh lift”. This was performed via a device Windship fashioned that allowed him to lift a progressive amount of weight through his hands from knee to waist height. Throughout his nationwide lectures he advocated that using this movement, among others, with high weight and low repetitions daily. Windship was quite strong with this partial power movement, and with training was was eventually able to lift 1208lbs with only his 150lb frame (2). Between the regular demonstrations of his strength along with his reportedly charismatic lecturing style, he gained extreme popularity. 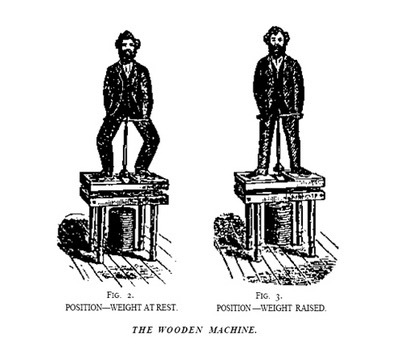 With time, like anything that can be sold, copycat machines were constructed and marketed to the public, and the movement was termed the Healthlift. Now plenty of health and fitness fads have come and gone over the years, with a more than a few proving to be foolish in retrospect. This little gem HERE of vintage footage gives a prime example. The healthlift, however, proved to be a thing worthwhile and irreplaceable. Machines were marketed for home use, and Health Lift studios were opened in urban areas (2). Although Windship died of a massive stroke at the young age of 42 (and with this the value of high resistance training questioned), the persuit of health through heavy lifting persisted. With time barbells were fashioned (3), and the healthlift moved closer to the floor, resembling the deadlift of today. With a more menacing name, it nonetheless continues to be the lift of choice (even compared to squatting) for moving large amounts of weight. Arguably it is a movement that comes quite natural to us in development. Simply watch any healthy toddler engage a large or heavy object, and you will see a “Grade A” deadlift spontaneously occur. With the striking grace of child compared to the majority of adults in our culture borne in mind, it is sad to think of the physical lessons we all to often forget with the first world conditioning we often endure. The body always adapts in the directions we allow it. Now the world record for the deadlift is a staggering 1102lbs, recently set by the massive strongman Eddie Hall. The video of this incredible feat can be seen HERE. Now, many would point out that having such strength is not necessary for most individuals to live a good life, but arguably, having a significant amount of strength in performing the deadlift is quite protective. If you can lift 100lbs well, 50lbs is much easier. If you can lift 200lbs well, 50lbs is easy, period. If you can lift 300lbs well, then when you have lift 50lbs awkwardly you likely will not have a problem. Why 50lbs? Because it is everywhere. It is your luggage, your arms full of groceries and a child, a bag of mulch or a bag of dog food. 50lbs happens every day for most of us, and if it is a strenuous load strain will happen. If it is only moderate then you get the pleasure of a little envigorating activity while doing some chores. But its not just that being skilled and able at lifting a heavy weight from the floor holds a key to minimizing your chances of having to work with someone like me….. There is a mountain of literature demonstrating the over whelming evidence that rigorous resistance training, done regularly, has far reaching benefits. Want to decrease your risk for cardiovascular disease, cancer, diabetes and osteoporosis in old age? Take up strength training (4). Want to lose weight? One of the most effective ways to do that is to increase your muscle mass and as a result metabolic rate. What is the best way to do that? Take up strength training (5). Want to decrease your low back pain, arthritic discomfort, or general muscular aches and pains? Want to keep it simple and focus on doing one movement well over dozens of movements adequately at best? How exactly one goes about practicing and training the deadlift safely, successfully and durably is far beyond the scope of this article. It is an exercise that appears at first glance crude and thus deceives the ignorant into believing there is little technical mastery to it. Nothing could be further from the truth, and if one needs a little proof of this just keep in mind all the wretched amoungst us that cannot tolerate simple lifting of house hold objects from the ground. By definition, if you have back pain with lifting an object, you are not good at it. There are many resources available in print and on the internet that describe the mechanics of the deadlift, but nothing can surpass the guidance of a well educated and accomplished strength coach. This means that the person is strong, not just studied, and studied, not just strong. The aide of a coach to teach and train your form and technique is priceless for ones initial success and long term longevity. If you are one of the unlucky who has pain with attempts at deadlifting, I would recommend seeing a physical therapist (preferably one that lifts) first to get this under control. Regardless, here are some resources for approaching this deceptively simple, but far reachingly beneficial exercis. The first batch comes from Eric Cressey, a strength and conditioning coach who has made a name for himself not only conditioning professional baseball players, but has also proven to be a resource for approaching the deadlift in a technical manner. His three part series originally published through T–Nation several years ago holds up as an excellent guide available to all online. The second resource the is recommended is found in form of print. Yes, some good things must be paid for. Written by Andy Bolton (world record holder for the deadlift, and the first man to lift 1,000lbs) and Pavel Tsatsouline, the book Deadlift Dynamite is an fantastic guide to approaching and training the deadlift from two individuals who understand strength in and out. Perhaps a good way to think about the far reaching utility of attaining and maintaining a strong deadlift capacity is simply seen in its previous name; the healthlift. If you can do it, you are healthy. If you cannot, you are not! Posted in Health and Wellness, Physical therapy, Rehabilitation, Strength and conditioning.